Tuck Box or Telescopic Box? Stretch goal or straight up? This was an easy one, telescopic boxes all the way. For those of you less familiar with these terms, a tuck box is an all in one box where one side can be opened and then tucked back in to close it. A telescopic box is a two piece box, i.e. a bottom bit and a lid! When your packing the cards into a tight fitting space, there's no two ways about it, tuck boxes are just fiddley. We want a telescopic box from the get go, no stretch goal required. We're looking at possibly making this a stretch goal. It would require a 50% bigger box which may impact on delivery costs and will increase manufacturing costs a smidge. If we can do it and still deliver the game at a low price point then we'll make it so! 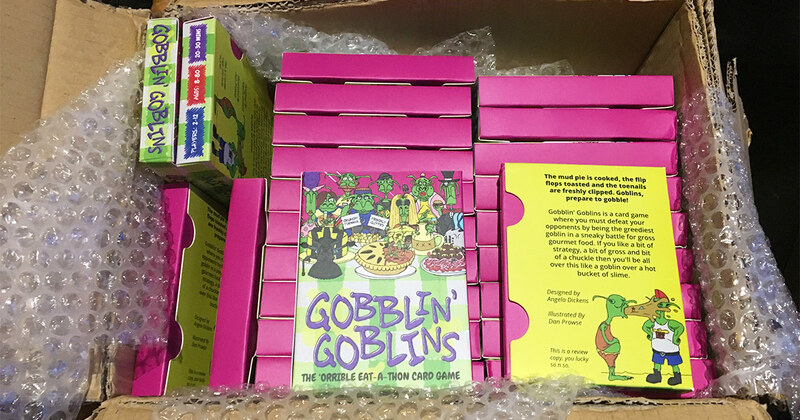 Gobblin' Goblins is a light game and the price should reflect that, it shouldn't cost an arm and a leg. Perhaps a bucket of slime's worth? We like buckets of slime. Did you notice? Big thanks again for everyones' feedback on this! Keep your comments coming, we'll be pushing to make the game as good as it can be right up until the production run.